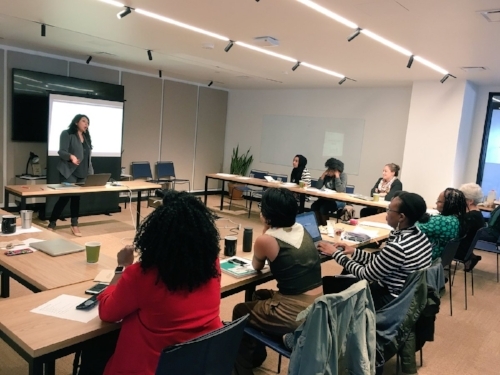 In the effort to increase the voices of women of color in peace, security and conflict transformation, WCAPS is working with ReThink Media (ReThink) to build confidence and increase the voices of women of color in the media. WCAPS has an alumni network consisting of the program participants who will continue to engage with each other and with ReThink on media outreach. WCAPS will also implement a series of webinars for college seniors, graduate students, and young adults. These webinars will begin in January 2019. If you are interested, please email your interest to wcaps@wcapsnet.org. Participants of the October 2018 WCAPS Media Training at ReThink Media. WCAPS is offering media training webinars with ReThink Media. The webinars will begin in January 2019 and will be for six months, one hour per session. The training is open to college seniors, graduate students and young adults interested in or working in the fields of peace, security or conflict transformation. A WCAPS/ReThink Media certificate will be given to participants at the end of their successful completion of the webinars. To apply to the webinars, please to here. WCAPS ReThink Media Training during the Carnegie Conference on Nuclear Policy, March 13, 2019. LobeLog was launched in 2007 by Inter Press Service (IPS) for which Jim Lobe served as Washington DC bureau chief since 1980. It initially focused on neoconservatives and their influence on US foreign policy but gradually broadened its scope to cover U.S. policy toward the Greater Middle East, with an emphasis on Iran, Israel-Palestine, and the Persian Gulf states more generally. It has also regularly published posts by contributors on various global themes, notably the militarization of U.S. foreign policy, the rise of far-right movements in Europe and beyond, the attacks against and threats to international and multilateral institutions and human rights law, mainstream media coverage of foreign affairs, the rise of China in the Middle East and Central Asia, and the North Korea crisis, among others. Regular contributors offer a variety of views on these issues, generally ranging from realist to liberal internationalist to non-interventionist. The blog also crossposts pieces from other websites, including the progressive Israeli-Palestinian site +972mag, eurasianet.org, the International Crisis Group, Human Rights Watch, and the European Council on Foreign Affairs. LobeLog was the first and only weblog to receive the Arthur Ross Media Award for Distinguished Reporting and Analysis of Foreign Affairs from the American Academy of Diplomacy. It was also named last year as the “Site of the Month” by the Foreign Service Journal. In recent years, the blog, which has been based at the Institute for Policy Studies since 2015, has been supported primarily by the Rockefeller Brothers Fund, the Ploughshares Fund, and the Arca Foundation. It normally pays contributors $100 for articles, which usually run between 750 and 1200 words. Contributors must approve final drafts before they are posted. If you are interested, contact ipswas@igc.org with any questions they may have about writing for LobeLog.